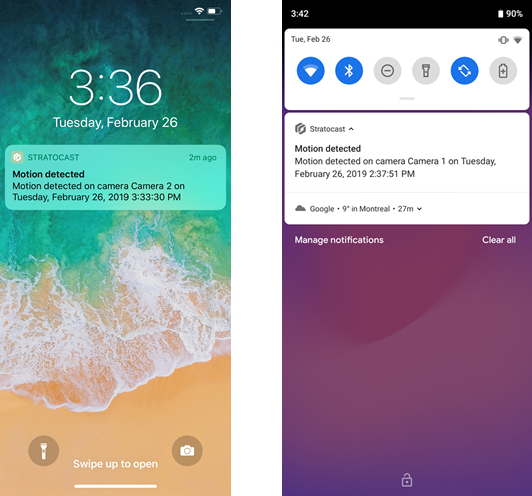 A push notification is the delivery of information or a message from a software application to a mobile device, without a specific request from the client. Push notifications can notify an end user about motion detected events on their phone or mobile device. Watch this video to learn more. Click the Captions icon (CC) to turn on video captions in one of the available languages. If using Internet Explorer, the video might not display. To fix this, open the Compatibility View Settings and clear Display intranet sites in Compatibility View. When a camera associated with your account detects motion, your phone or other mobile device receives a notification about the event. The notification includes when the event happened and which camera detected movement. Push notifications can be set up for each camera, and you can assign a notification schedule to the camera so that you only receive notifications during the specified days and times. Each camera can have multiple notification schedules, which are easily modified, enabled, or disabled as required. Push notifications can be used to quickly open the video at the motion detected bookmark in the Stratocast™ mobile app. The following examples show the iOS or Android push notifications that are sent (if configured) when a camera detects motion.